As you may well know, online registration for INQAAHE Conference 2019 is open. Do not miss the early bird offer! 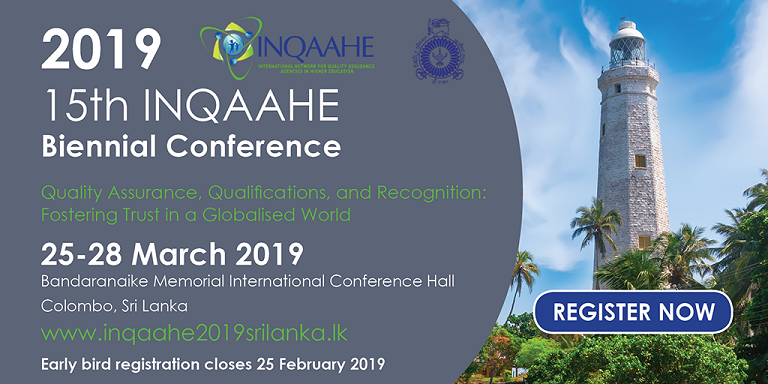 Proudly hosted by the University Grants Commission (UGC), the INQAAHE 15th Biennial Conference will be held in Colombo, Sri Lanka, from 25th – 28th March 2019. The theme of this year’s conference is Quality Assurance, Qualifications, and Recognition: Fostering Trust in a Globalised World. We recommend you to visit the official Conference website for more details. Also, on behalf of Prof. Deepthi C. Bandara, Consultant/Quality Assurance Council at University Grants Commission (Sri Lanka), we recommend you to check the invitation letter to participants and the "Visit to Sri Lanka made easy" guide for you to consider if attending the event. If you have any question related to the registration process, you can contact both Secretariat (secretariat@inqaahe.org) and/or the Conference host (inqaaheconf2019@ugc.ac.lk and onali@ugc.ac.lk).